Hurricane Matthew was sweeping along the coast of the Carolinas; the Triangle got some rain — at times heavy rain — along with some flooding and a bit of wind. But otherwise, little weather-related drama took place in my part of the Old North State. I arrived at the coffee shop without incident and settled in for some hot tea, a snack and a bit of computing. When the shop closed, I reapplied all my clothing, packed up my computer and headed south toward Ninth Street. Night had more or less fallen, but the wind seemed to have died down a bit, and the rain was unremarkable. It’s at this point, by the way, that something interesting — but not too interesting — happened. I’ll describe it in a separate post. And now: The interesting-but-not-too-interesting thing that happened! By way of context, Joe Van Gogh in Durham, N.C., is located on what I think of as being the ground level of a two-story building on Broad Street. As one moves west toward Broad Street, the earth rises and crests. The upshot of this is that the building’s other level is lower — that is, a basement space. The exterior wall of the lower level is exposed to open air on the east side but effectively buried beneath the sidewalk on the west side. As I mentioned briefly during my writeup of the Stanford-Notre Dame game, the Fighting Irish’s 10-3 loss to North Carolina State in Raleigh on Oct. 8 took place in waterlogged conditions. That day, Hurricane Matthew was sweeping along the coast of the Carolinas; the Triangle got some rain — at times heavy rain — along with some flooding and a bit of wind. But otherwise, little weather-related drama took place in my part of the Old North State. I spent much of the morning and early afternoon sleeping in, as that was when the rain seemed to be heaviest. But after a while, I got cabin fever, and since the rain seemed to have diminished, I stuffed my laptop into my backpack and donned weather-resistant clothing and headed out. With one caveat: I’d intended to put on my water-resistant boots but forgot to do so, lacing up my regular sneakers instead. By the time I realized my mistake, I was all set to go, so I just decided to let things ride. I should have taken my own suggestion. On Saturday, I contemplated going on a long walk prior to Stanford’s kickoff against Colorado. Instead, I took the lazy route and lounged about my house before walking one mile so I could take care of an errand right before kickoff. 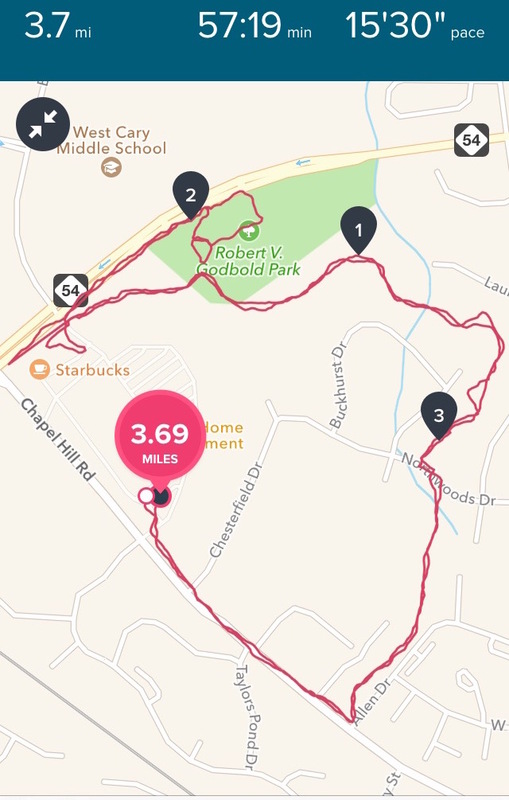 Later, as the second half was getting under way, I walked about three-quarters of a mile from a residential area where I parked my car to an establishment in Durham’s Brightleaf district. So I did not embark upon anything close to a 58-minute, 3.7-mile walk — and perhaps as a consequence, my superstitious self tells my supposedly rational brain, the Stanford football team turned in a thoroughly inept 10-5 loss to Colorado. Blecch. This offense, man. As I wrote yesterday, the five-point output — two of which, of course, were generated by a safety — was Stanford’s lowest scoring total in any game since Sept. 29, 2007, when No. 23 Arizona State pounded the Cardinal, 41-3. A punchless Stanford football team went down to defeat Saturday, dropping a 10-5 home decision to a resurgent Colorado. It was only the Buffaloes’ third win in 21 games that the program has played in the state of California. Colorado moved to 6-2 overall and 4-1 in the Pac-12, while the host Cardinal dropped to 4-3 and 2-3. The Cardinal offense mounted 12 drives on Saturday afternoon, and most of them resulted in a display of futility. The team turned the ball over four times and punted five times, including a trio of three-and-outs. Only five Stanford possessions spanned five or more plays; only three advanced more than 28 yards. Stanford has now scored four offensive touchdowns in its past five games. Of those, only two — second-half scores against UCLA and Notre Dame — had a material impact on the outcome of the contest. Quarterback Ryan Burns turned in what I would deem a Burnsian performance, only more so: He made some nifty plays, mainly short- and mid-range throws that he zipped to Trenton Irwin, who finished with seven catches for 88 yards. But these were offset by missed opportunities and adverse plays. Burns completed 16 of 29 passes for 170 yards (5.9 yards per attempt) with no touchdowns and three interceptions, two of which took place in the final period. He also was involved in two fumbles — one in the second quarter, which Stanford tackle Casey Tucker got back, and another in the fourth quarter, which Colorado linebacker Kenneth Olugbode recovered following a muffed center-QB exchange. Going into Stanford’s home game against Washington State, I had a sense of foreboding. A similarly dire feeling once again took hold of me ahead of the Stanford football team’s visit to Notre Dame. True, the Fighting Irish had an unimpressive 2-4 record, having face-planted their way to a 10-3 loss at North Carolina State in their previous outing. But that game had taken place in a Raleigh that was waterlogged thanks to the outer bands of Hurricane Matthew; otherwise, the Irish had scored at least 28 points in all of its games. Since the Cardinal defense had allowed 86 points in the past two games, Notre Dame seemed to have an excellent chance of racking up touchdown after touchdown. By contrast, 3-2 Stanford hadn’t scored more than 27 points this season and was averaging just 19.4 points a game. Would the Irish defense, which had surrendered 33 or more points in four of its games, be the cure for the Cardinal offense? I had trouble being optimistic, especially when I arrived at a Stanford alumni watch party and saw on the television that the Cardinal’s all-world back, Christian McCaffrey, was not wearing football gear. The British author John le Carré has written 23 novels, according to Wikipedia, of which I’ve read about two-thirds. If one were to draw a Venn diagram of le Carré’s oeuvre, there would be two main “bubbles,” or categories: Those in which the protagonist is a professional spy and those in which she or he is not. An example of the former would be all of the so-called George Smiley novels, of which Tinker Tailor Soldier Spy is perhaps best known: Smiley devotes his entire career to British intelligence. An example of the latter would be many of le Carré’s other books, such as two of my favorite novels by him: 1993’s The Night Manager, in which a hotel manager is drafted for an operation targeting illicit international arms dealers, and 2001’s The Constant Gardener, in which an ordinary British diplomat begins to uncover shady doings by a multinational company after the death of his unfaithful wife. Several other le Carré books feature amateurs who dally in espionage. There’s The Russia House (1989), wherein a British publisher becomes a courier for a spy ring; The Little Drummer Girl (1983), in which a radical English actress is recruited to locate a Palestinian terrorist; and Our Kind of Traitor (2010), in which a professional London couple decides to help a Russian money launderer and his family defect to England. And what, you may ask, of the overlapping between the two bubbles? This area is dedicated to two kinds of novels. One type has multiple leading characters, some of whom are professional spies and some of whom are not; the other, a leading character whose status is nebulous or transitional. In The Tailor of Panama, there are two main characters: The eponymous tailor and the duplicitous British spy who recruits him. Obviously, this homage to Graham Greene’s Our Man in Havana belongs to the first type, as does A Most Wanted Man, with its multiple characters, some intelligence professionals and others (more or less) ordinary individuals. A Perfect Spy tracks its main character, Magnus Pym, from childhood through a key episode in his adulthood; this book, of course, belongs to the second type. A few weeks ago, I was chatting with an acquaintance who was munching on some roughage — I believe it may have been celery. When a bit of food went down the wrong way, she started coughing and excused herself to walk around the corner to the water fountain. As the coughing persisted, a clerk came to me and asked if my acquaintance was OK. I said I thought she would be. But as my acquaintance continued to cough, the clerk walked over to aid her. I also became alarmed and followed the clerk over. At my acquaintance’s insistence, the clerk thumped her on the back, thus restoring some natural order to her windpipe. It was a minor incident, but afterward I found my nerves on edge and my eyes somewhat teary. Death had not made an impact on my life that day, but it had come far too close for comfort. My acquaintance and I talked a bit about how it’s important to savor every moment, especially the good times, because you never know when your life is going to change permanently. And after the Stanford football team sustained its second ugly defeat in a row, I’ve tried to keep that lesson in mind. Don’t take the good times for granted, friends, because you’ll need them to buoy your faith during the bad times. With that in mind, here’s my second edition of B-U-G — that’s bad, ugly and good — for Stanford football. Last week, when the Cardinal fell to 3-1 overall and 2-1 in Pac-12 play following the 44-6 defeat at Washington, I categorized the North Division title chase as The Ugly. This week, now that the Cardinal has fallen to 3-2 and 2-2 following a rout at home by Washington State, the division standings have been downgraded. I struggled after the UW loss to find a scenario in which Stanford might advance to the Pac-12 championship game — a situation that necessitated the Huskies sustaining at least two conference losses. Now that both Washington schools own wins over the Cardinal, the Cardinal can kiss its chances of repeating as conference champions goodbye. And unless the Cardinal pulls itself together and runs off seven straight wins, which is possible but certainly not likely given how badly the squad has played in the past two contests, the team’s chances of getting a berth in a prestigious bowl are probably shot. At Empire’s Edge, a 2009 novel by William C. Dietz, is an entertaining if low-rent science-fiction thriller set on a remote colony world in the far future. The book’s main protagonist is Jak Cato, a “section leader” in a group of genetically engineered police officers whose psychic sensitivity enables them to identify a race of malevolent alien shape-shifters known as Sagathi. When a space battle forces his unit to set down on Dantha, the planet’s venal ruler, Uma Nalomy, arranges to have Cato’s fellow cops murdered in order to use their prisoner as an assassin. This deadly scheme is prompted by the imminent arrival of a high-ranking official of the Uman (read: Human) Empire. Isulu Usurlus may be decadent, but he’s a relatively decent sort, and he’s outraged by Nalomy’s blatant corruption, oppression of her subjects and squandering of imperial resources. By replacing one of Usurlus’s trusted aides with the shape-shifter, who goes by the unfortunate name of Fiss Verafti, Nalomy hopes not just to tighten her grip on Dantha but to expand her influence on the galactic stage. There were a number of encouraging omens for the Stanford football team entering Saturday night’s home contest against Washington State, despite the fact that the Cardinal was coming off of a crushing 44-6 road loss to the University of Washington. Item: Stanford was tied with Alabama, Boise State, Clemson and Louisiana State for having the fewest home losses since 2010 — four apiece. The team hadn’t dropped an October contest at Stanford Stadium since 2007. Item: Under head coach David Shaw, Stanford had a perfect 5-0 record against Washington State. Item: Stanford had beaten WSU eight straight times, going back to 2008. Item: Under Shaw, the Cardinal had won 13 times and lost just once in games following a loss. Item: On Saturday Stanford broke out its all-black uniforms, which debuted in 2010, for only the eighth time in history. The team was undefeated when wearing these dark-hued duds, including a 41-22 win over USC in the 2015 Pac-12 championship game. Actually, my foreboding wasn’t entirely baseless. The Cardinal had been beaten, and beaten very badly, by the Washington Huskies in their previous game. In that contest, UW had played the kind of physical football that used to be a Stanford trademark. By contrast, Washington State had soundly defeated Oregon last week. The Cougars owned a two-game winning streak over the Ducks, which is something that even Stanford, the reigning conference champions, could not claim. And the Cardinal had injuries that would hold out several significant players. Davis Shaw is a obviously a great coach, but I feel he is good for one of these absolute stinkers a year. I started wondering about that — specifically, is it true? My musings prompted me to write this post about the Bad, the Ugly and the Good, a.k.a. the B-U-G, for Stanford football. David Shaw is in his sixth year seventh year at the helm of the Cardinal football team. Obviously the 44-6 slaughter in Seattle was this year’s stinker. But what about previous seasons? I consulted the Stanford football media guide. The team lost only twice in 2015 en route to a 12-2 record. One of those defeats was a hard-fought 38-36 home loss to Oregon — much too close a game to call a stinker. No, the obvious stinker from last season was the season-opening 16-6 loss at Northwestern, in which a stultified Cardinal managed to convert just three of 15 third-down tries. What is it about weeknight games in Seattle? Four years ago, an unbeaten Stanford football team traveled to Seattle for a nationally televised Thursday night game against the University of Washington and turned in a dreadful performance, losing 17-3. Like that 2012 team, the 2016 Stanford Cardinal was 3-0 going into its contest with the Huskies. In both cases, those records included a stirring home win against USC. Like that 2012 team, the 2016 Cardinal was coming off a prestigious postseason appearance the year before: The Fiesta Bowl in the former case, the Rose Bowl in this case. And like that team, the 2016 Cardinal was trying to replace a record-setting quarterback. In 2012, the departed signal-caller was Andrew Luck, who was succeeded first by Josh Nunes and eventually by Kevin Hogan; this year, Hogan is gone, with neither Ryan Burns nor Keller Chryst having asserted a firm claim to the position. Like that 2012 team, the 2016 Stanford turned in a dreadful performance — only this was much much worse than what ESPN viewers saw four years ago. On Friday night, Washington (5-0, 2-0 in the Pac-12) systematically dismantled Stanford, 44-6, with the Huskies dominating virtually every aspect of play. Mike Birbiglia’s 2016 comedy Don’t Think Twice is a touching look at a troupe of improvisational comedians whose performances belie their resistance to change. When the movie begins, most of the members of the Commune are content with their lot in life. Their New York City improv group is popular, they eke out enough money to afford the basics of life — with a major assist from their side jobs, or, in one case, from her wealthy parents — and they’re satisfied with the artistic purity of their spontaneous comedic stylings. The dean of the group is in some ways the happiest of the lot. Miles (comedian and This American Life contributor Birbiglia, who also wrote and directed the picture) beds an endless progression of his 20-something improvisational-comedy students by rolling out an effortless, almost automatic patter. But he’s convinced himself that he was this close to getting a slot of the popular TV show Weekend Live, an obvious analog for Saturday Night Live. His repressed frustration boils over when Jack (Keegan-Michael Key of the brilliant sketch-comedy show Key & Peele) is invited for an audition and hired as a junior writer-performer for the program.